World doubles number one Jamie Murray and partner Bruno Soares reached the Monte Carlo Masters final with a 6-2 6-4 win over Marcelo Melo and Ivan Dodig. 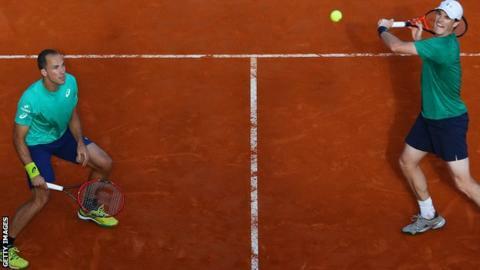 The Australian Open champions, seeded fourth in Monte Carlo, sealed victory in 67 minutes. The Briton and the Brazilian went 4-0 up in the opening set and held firm to remain top of the ATP doubles rankings. A reflex Murray volley sealed the match and improved their season record to 17 wins and only three defeats. In the final they will meet either Pierre-Hugues Herbert and Nicolas Mahut, who beat Murray's brother Andy and Dominic Inglot on Friday, or Juan Sebastian Cabal and Robert Farah. Brazilian Melo would have regained his individual number one doubles ranking with victory alongside Dodig of Croatia. But the second seeds, playing in their first semi-final of the year, were unable to take any of their four break points and decisively lost serve in the ninth game of the second set. Never want to miss the latest tennis news? You can now add this sport and all the other sports and teams you follow to yourpersonalised My Sport home.